Chris and Dawn are the absolute sweetest people you could ever imagine! 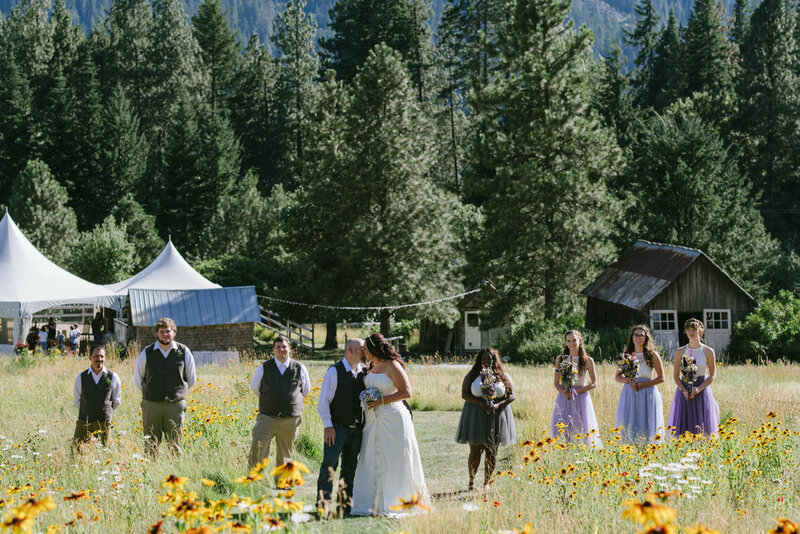 They had the sweetest ranch wedding up at Browns Family Homestead with their nearest and dearest family and friends. The broach bouquet and boutonnière by DA Couture by Danielle Aspinwall were just out of this world and made for the perfect detail to set their wedding apart. The glitter and shine really made her day sparkle. Not like this beautiful bride needed much more. Dawn is really one of the nicest people I know and she looked stunning on her day. 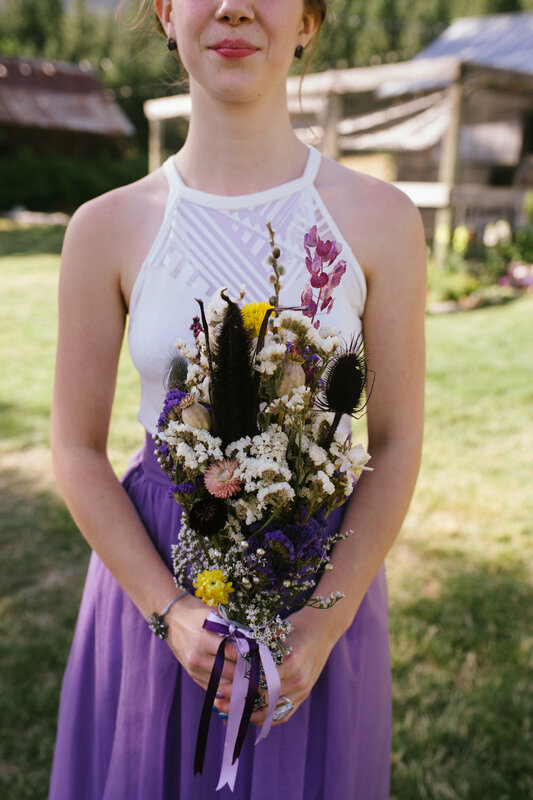 Her adorable sweetheart dress from David's Bridal couldn't have been more perfect and that natural makeup look from Onsite Beauty by Brooke put on the finishing touch. I loved the location of the ceremony because the guests and wedding party had the most beautiful ascent up the hill. 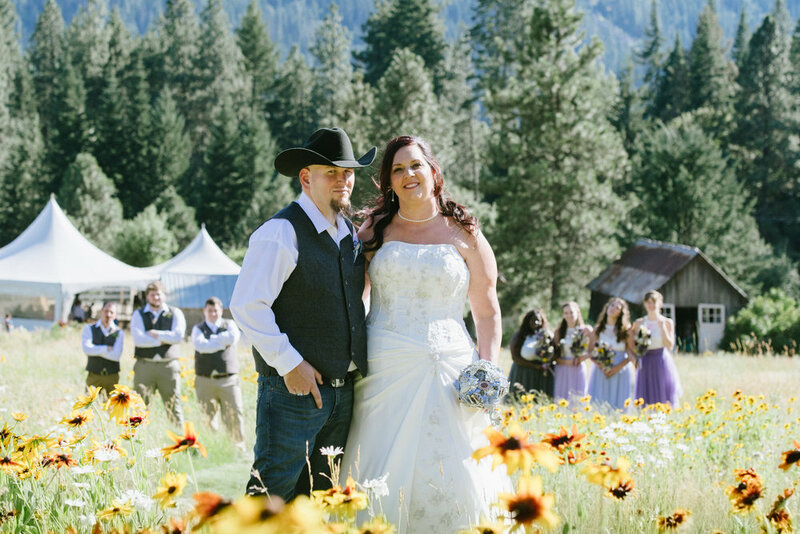 Wildflowers of all colors and Leavenworth mountains in the background gave them the perfect backdrop to say their I do's. Did I mention they had the CUTEST family ever?? The two had a sand ceremony where all of the kids dropped in their own colored sand to create a heartfelt art piece for their home. Browns Family Homestead really made it easy to love with their many barns and picturesque views. Probably the hit of the night, though, was the horse that was allowed to roam around the main area for the kids (and adults!) to pet. Chris sang a song for his bride at the ceremony too. It was really heartfelt and I don't know if there was a dry eye in the room. In Case You Didn't Know (Brett Young) ... wow, Chris. You really know how to get 'em melting. Love by the Slice Baking & Catering really did a number on the cake and cupcakes as well. I mean... have you EVER seen such a beautifully done natural cake in all your life?! Oh and did I mention it was delicious?! Thank you for such a beautiful wedding day up on the mountain with you and your amazing family! I can't wait to see what is in store! Have Yourself a Very Merry Christmas Card!